Jumper: ASOS, jeans: Monki, sold out, but love these and these; shoes: ASOS. Hello, hope your week is going well:) Have you noticed that spring has actually started? Can't wait to stop freezing every morning while waiting for the DLR train.. brrr... Obv, you know that denim is really huge this season, I mean who doesn't? We've been trying on few styles in the office and I decided to go for something I would never wear, like an A-line dress without defined waist and these funny wide pants. Never thought I would wear something that unfeminine, but I actually liked it and keep wearing them like every second day with heels or trainers. My advice would be to experiment with new shapes and forms: skinny jeans won't be enough this season. 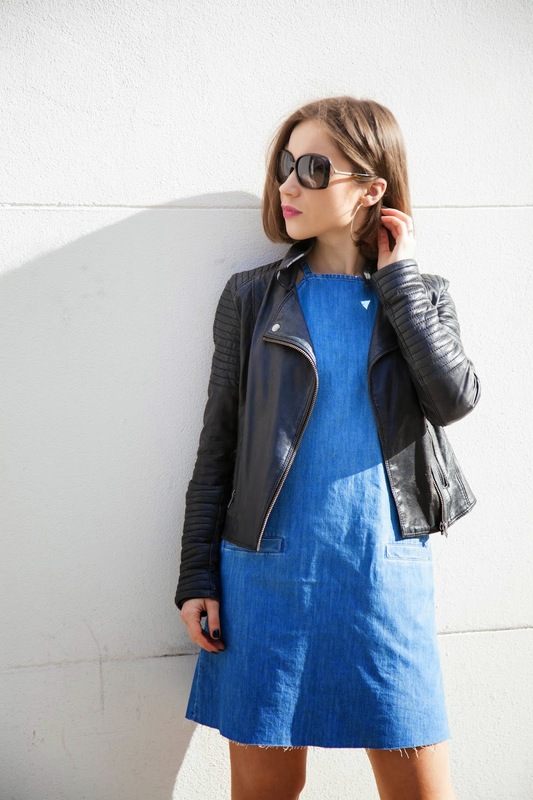 Now I'm in a search for a denim dress with ruffles: it looks like this trend will last for few seasons. Привет, спасибо, что заглянули! Весна почти тут! Как я хочу перестать мерзнуть по утрам на остановке, так как зимние вещи я не ношу просто из принципа: ну сколько уже можно! :) На днях мы решили примерить несколько образов из денима, который, как все уже явно знают, объявлен чуть ли не главным трендом сезона. Никогда не носила неприталенные платья и уж тем более такие смешные штанишки - и короткие, и широкие. Все мужчины вокруг смотрели косо, но мне понравилось. Мерила с опаской, а теперь ношу через день то с каблуками, то с кроссовками Adidas. А на лето ищу джинсовое платье с оборками, так как похоже, что этот тренд задержится. Great outfits! Love how the color combination is so cool to the eyes! i really love what you did in this outfit, mixing the sweet and edgy look together! You rock your outfit! I love the combination of that blue dress and oversized coat. You look so fab! That's so incredibly sweet of you! Thanks! I really like the denim dress with the long grey coat!! Love your blog,your photos, your outfits and just everything! I ja tozhe v Londone i pishu o mode. Zamechatelnij u tebia blog! Юлия, спасибо огромное, очень приятно! Good post :D you have such a good style and photography ! So kind of you! Thanks a lot! The last one is absolutely my favorite and the red heels are to die for! In love. Looking so chic in this blue number. Love the denim clothes. Looks so great on you! Интересный образ с колютами, а платье очень понравилось, очень здорово смотрится!! !